Running Time: Disc 1-128m. Disc2-97m. Documentary filmmaker J.M. 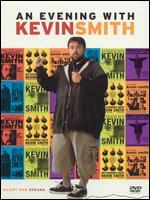 Kenny, who has worked on dozens of DVD making-of pieces, including those for the Smith's Mallrats and Dogma, happened to catch one of the college appearances, and suggested to Kevin that they begin to film them. Thus, An Evening with Kevin Smith was born. This four-hour program is pieced together from four different college visits. The camerawork isn't exactly exciting�for the most part, it just focuses on Kevin onstage, with cuts to the audience when a question is asked or there is a lot of laughter�but the static set-ups do little to impact the humor. Kenny has edited together what basically amounts to an interactive stand-up routine, and there's nary a bad joke in the bunch.